This is one of the first dishes Owen ever cooked for me, and is a great way of using up lots of green vegetables. As usual I don't tend to follow any particular recipie, hence the quantities are a little vague. I tend to use enough vegetables to feed four and about 2-3 tablespoons of yogurt. Fry the leeks till soft, add the courgette, followed by peas and broccoli till they are all cooked, season with salt and pepper. Once they are cooked tip into a bowl and mix in some yogurt, feta (cubed) and a pinch of cumin. 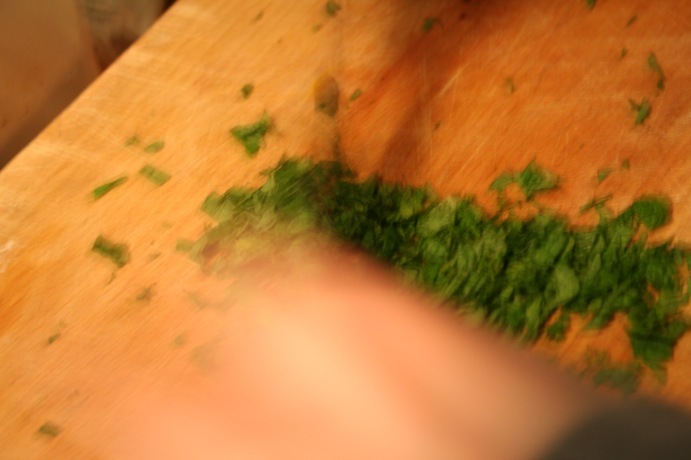 Add in a handful of chopped mint and parsley. Brush a dish with oil and then layer a sheet of filo pastry, brush with oil and add another layer, I normally place about 6-10 sheets of filo pastry. Add the filling and then top with more sheets of filo pastry, then place in a hot oven to bake for about 30 mins. For years I believed that deep frying something was some dark art, and one you wouldn’t attempt at home without a deep fat fryer – probably because of those films that showed how cooking chips was essentially a short cut to burning down your house. Since then, my wife’s delicious samosas, pakoras and other great tasting snacks taught me otherwise. Despite this I only did fish in batter for the first time last year, and (for health reasons) oven cooked, rather than fried, the chips. Whether this really helps on the health front when I’ve deep fried the fish I’ve no idea – especially when you look at the mushy pea recipe. In summary, this was easier and much better than I expected, but for those watching fat intake should be saved for special occasions. I’ve done this with both plaice and haddock (pictured here), but I think plaice works better (mainly because it cooks much much quicker. you like) into chip sized pieces, dry off (with a tea towel), and put into a roasting tin with some salt and good quality, extra virgin, rapeseed oil. Put in the over for about 30 mins – give them a turn/shake about half way through. Put the peas and chopped mint in a saucepan with a knob of butter, put the lid on and simmer (no water required) – 10 minutes or so (possibly a bit more if you are using fresh peas). Add lemon juice (to taste) and salt and pepper (of course, to taste). Then mash them – I prefer them to mash them reasonably roughly. OK – now the fish. 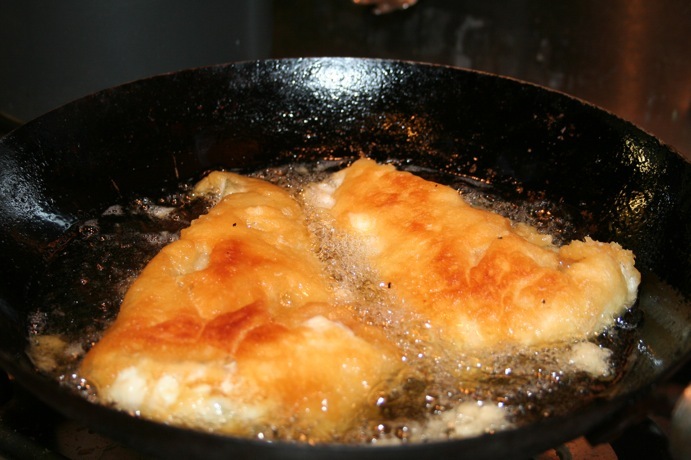 Obviously you want to be using fillets – as I say, flat fish cooks quicker, and I think is better (Marco Pierre White says that you can’t beat fish and chips made with turbot – I’ve had to take his word for it to date). Mix all these together and whisk until smooth – you want it to be thick enough to stick to the fish! This is probably the point to put the oil on – you can use vegetable, rapeseed or sunflower oil – any oil that is suitable for deep frying (basically not olive oil). I’ve started doing this in a wok – it heats up extremely quickly, and you can get away with a relatively small amount of oil – also the wok is going to be oily anyway, so you aren’t going to ruin it this way. You can tell when the oil is ready by dropping in a crumb of bread – you want it to ‘fizz’ and float to the top of the oil. 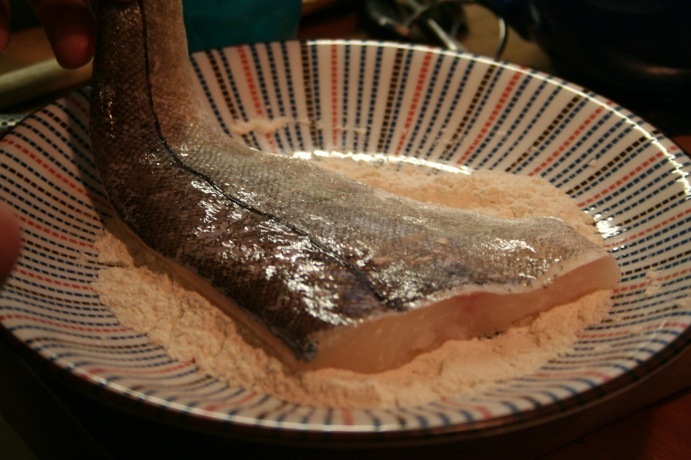 Season the fish with salt and pepper, then put some flour on a plate and lie each fillet in, one at a time, to cover with a thin layer of flour – shake off any excess. Dip the fish in the batter mixture – make sure it is covered, then hold it up and shake it a bit – letting excess batter drip off. Carefully lay the fish into the hot oil (see advice on checking the temperature above) – you really want to be careful here. You should be able to do two fillets at the same time in a reasonably sized wok. They’ll take a few minutes each – it really depends on the thickness of the fillet. You’ll also probably want to turn them over after a couple of minutes – essentially once the bit in the oil is crispy and brown, I would turn to get the same colour on both sides. Once they are done, take them out and put them on kitchen paper to drain. I cut into one of them at this point to check it is done – if not, back in the oil for a bit longer. I do find this can be tricky, as it can all start to fall to pieces if you aren’t careful – in general it is much better if they are done at this point! Hopefully everything is done by this point, and you can serve up – with plenty of salt, malt vinegar, and if you like, ketchup.